We are all familiar with the slogans: the promise of a “new springtime,” a “civilization of love,” a “new Pentecost,” and now, a novel orientation named “the spirit of Assisi” (1). In a recent lecture called “The New Pentecost vs. the True Pentecost,” I explained that the only way we could call anything a “new Pentecost” is to test first how it compares with the true Pentecost as recorded in the Acts of the Apostles (2). There I described how, point-by-point, the so-called “new Pentecost” fails to measure up to the first Pentecost, especially regarding the conversion of the Jews. Often, the so-called “new Pentecost” is the direct opposite of what we see in the true Pentecost. Likewise with the “Spirit of Assisi,” a previously unheard-of term that recently came into vogue in Catholic circles. The term automatically invokes the idea that there is a connection with Saint Francis of Assisi. So, what does the “spirit of Assisi” have to do with Saint Francis of Assisi? Nothing! In fact, they are contradictory spirits. Within a Catholic context, it is not possible to have a “spirit of Assisi” that is divorced from Saint Francis of Assisi. Yet this is exactly what the pan-religious “spirit of Assisi” is. It is something that Saint Francis of Assisi would have regarded with absolute horror. The “Spirit of Assisi,” spearheaded in 1986, comprises Catholics, Protestants, Orthodox, Jews, Moslems, Animists, Hindus, Zoroastrians, Witch Doctors, and various others gathering at the same place (usually at a Catholic church) to pray for peace. The Catholic praying to the true God, and members of false and heathen religions praying to their false gods. Could anything be more contrary to the spirit of St. Francis of Assisi? To place the one true religion of Jesus Christ on the same level with false creeds? Regarding non-Christian religions, Sacred Scripture teaches that “all the gods of the nations are devils” (Ps. 45:5). Regarding heretical religions, Saint Paul tells us that false creeds are the “doctrines of devils” (1 Tim. 4:1). Thus, Sacred Scripture and Sacred Tradition always forbade Catholics to engage in religious camaraderie with false religions (3). 2.	for the salvation of infidels and non-believers, whom he knew would be lost if they did not embrace Christ and His one true Catholic Church. His biographer, Fr. Cuthbert, OSFC, wrote in 1916 that Saint Francis was “apt to be impatient with meddlers and heretics to the end” (4). In fact, Saint Francis spoke harsh words about those who do not accept Catholic truth. He did not speak in vague terms about the “seeds of truth found in all religions.” Nor did he announce his famous trip to preach to the Moslems as “an invitation to dialogue between the great monotheistic religions in the service of the human family” (5). Thus, those who try to portray Saint Francis of Assisi as an apostle of Vatican II’s new brand of dialogue and ecumenism are simply not telling the truth. Especially since today’s ecumenism, of which the “Spirit of Assisi” is the most radical element, does not seek the conversion of non-Catholics to the one true religion, but only seeks to work together with all religions in a “reconciled diversity” for the “betterment of the human family” (7). There is no sharper contrast to this new, effeminate ecumenism that Saint Francis’ encounter with the Sultan, and his Friars’ missionary zeal among the Muslims. Around 1219, after a General Chapter of the Order, Saint Francis decided to undertake a mission to the Muhammadans in Egypt, where also there was a Crusade being fought. During this time, Francis stayed with the Christian army, and then crossed over to the Moslem lines. Once outside the Christian lines, he was seized by Moslem soldiers. Francis told the soldiers that he wanted to preach Christ to the Sultan, who allowed him into the camp. When brought to the Sultan, Francis said, “I am sent by the Most High God, to show you and your people the way of salvation by announcing to you the truths of the Gospel” (8). And when Saint Francis preached, the Sultan felt himself very much drawn to Francis and to the power of his words. So much so, that he invited Francis to stay with him. “Willingly,” Francis replied, “if you and your people will be converted to Christ”(9). Francis then proposed his famous challenge. He said: “If you yet waver between Christ and Mohammed, order a fire kindled and I will go into it with your priests that you may see which is the true Faith” (10). 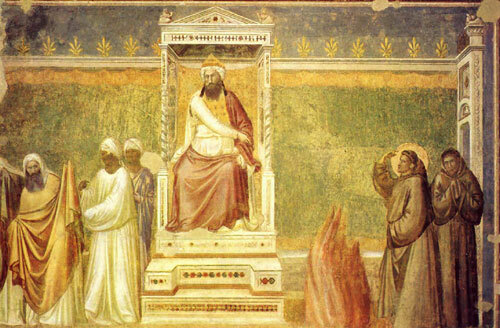 This painting by Giotto illustrates the famous challenge made before the Sultan. Saint Francis entered the enemy camp and challenged the Muslim priests to go into the fire with him to see which one represented the true religion. The Muslims refused. The Sultan was not willing to permit this trial by fire, so Francis requested permission to leave. And the Sultan gave orders that Francis be conducted back to his camp with courtesy. While this was going on in Egypt, there were five firebrand Franciscan Friars kicking up so much dust in Muslim Morocco that all five of them would be put to death. Their names were Brothers Berardo, Ortho, Pietro, Accurso and Aduto. First they went to Spain, to Moslem Seville. And because they tried to preach the Gospel there, they were scourged, imprisoned and expelled from that kingdom. Then they went over to Muslim Morocco in an attempt to convert the infidels. When they arrived, these Friars did more than just preach in the streets. They marched right into a mosque and denounced Mohammed from inside the mosque (11). The Friars were seized, imprisoned and scourged, but that did not temper their zeal. While in prison, they tried repeatedly to convert the jailers. The rulers of Morocco were trying to find a diplomatic way out of this, so they arranged that these imperious Friars be sent out of the country. And how did the five Franciscans respond? Father Cuthbert relates: “But the five Friars knew nothing of diplomacy and had not the temper to live and let live. Mohammed was, in their eyes, the enemy of Christ, and the souls of this people were rightful spoils for their Divine Redeemer. To go back upon their mission would be a traitorous backsliding from their fealty to their Savior” (12). At the first opportunity, these wiry Franciscans gave their jailkeepers the slip. Immediately, they returned to the city, and there they were again, in front of the mosque appealing to the infidels to renounce Mohammed and accept Christ. They were seized, cast into jail and tortured. While they were on the rack, the jailers promised the Friars that their lives would be spared and they would be given gifts, if they would deny Christ and accept Mohammed. The Friars responded by uttering the praises of Our Lord, and urged the torturers to renounce Mohammed and accept Jesus Christ. The Muhammadans answered by beheading each Friar, and casting their bodies outside the walls to be the food of dogs. A Portuguese dignitary arranged a stealth operation to have their bodies rescued. They were taken to Portugal, and with great reverence they were laid in the Church of the Canons Regular (Augustinian) in Coimbra. Among all the people who flocked to pray to and honor the martyred Franciscans, there was a young Augustinian Canon who was enraptured by the zeal and love of Christ that burned in these Friars. He sought out the local Franciscans and begged to be admitted to the Order. That young Augustinian, who became Franciscan, is now known to us as Saint Anthony of Padua, the Miracle Worker, whom Catholics honor with the title the Hammer of Heretics. And as for Saint Francis: What did he think of these five Friars who marched into a mosque and denounced Mohammed from within the Muslim’s own holy place? Who urged Moslems for their own salvation not to follow the false prophet, Mohammed? Did Saint Francis organize on the following March 12 a grand apology for the insensitivity of his friars for not understanding that the “Moslems, together with us, worship the same God”? No! Francis cried out in a transport of gratitude to Heaven, “Now I can truly say I have five brothers” (13). This is the true spirit of Assisi! 1. This short article is an excerpt from a more extensive speech by the author entitled “The Title of Assisi vs. Saint Francis of Assisi.” It is available on cassette for $8 post paid from Oltyn Library Services, 2316 Delaware Ave, PMB 325, Buffalo, NY 14216. 2. This lecture is also available from Oltyn Library Services. 3. For Scripture references, see Bishop George Hay, CRFN, “Ecumenism Condemned by Sacred Scripture,” Catholic Family News, May 1996 (reprint No. 292, US $1.75). For the finest summary of the Magisterium’s consistent condemnation of ecumenism, consult Pope Pius XI’s 1928 Encyclical Mortalium Animos, “On Fostering True Christian Unity,” Available from Catholic Family News for US $4.25 postpaid. 4. Cuthbert, Life of Saint Francis of Assisi (New York: Longmans, Green and Co., 1916), p. 12. 5. Sadly, this is a direct quote from Pope John Paul II. See “On Pilgrimage to Mt. Sinai,” Origins, March 9, 2000. Regarding John Paul II’s disappointing commitment to ecumenical novelties, Fr. Joseph de Sainte Marie, who was a theologian and loyal son of the Pope, emitted the broken-hearted lament and warning: “In our day, and it is one of the most obvious signs of the extraordinarily abnormal character of the current state of the Church, it is very often the case that the acts of the Holy See demand of us prudence and discernment” (Cited from A propos, Isle of Skye, Scotland, No. 16, 1994, p. 5). 6. Admonitio prima de Corpore Christi (Quaracchi edition, p. 4), quoted in Johannes Jorgensen, St. Francis of Assisi (New York: Longmans, Green and Co., 1912), p. 55. 7. One example among many, Cardinal Walter Kasper, appointed by Pope John Paul II as the Prefect of the Vatican’s Pontifical Council for Promoting Christian Unity, recently said, “Today we no longer understand ecumenism in the sense of a return, by which the others would ‘be converted’ and ‘return to being Catholics.’ This was expressly abandoned at Vatican II” (Adisti, February 26, 2001). English translation quoted from “Where Have They Hidden the Body,” by Christopher Ferrara. See also Iota Unum, chap. 35, where Romano Amerio demonstrates that converting non-Catholics to the one true Church is not the aim of today’s practice of ecumenism. 8. Lives of Saints, “Saint Francis of Assisi” (John J. Crawley & Co.,1954). 9. Cuthbert, Life, p. 280. 10. Lives of Saints, John J. Crawley & Co.
11. Cuthbert, Life, p. 283. 12. Ibid., p. 284. 13. Ibid., p. 285.